Cytokinesis is the final process in eukaryotic cell division, which divides the cytoplasm, organelles, and cellular membrane. Cytokinesis typically occurs at the end of mitosis, after telophase, but the two are independent processes. In most animals, cytokinesis begins sometime in late anaphase or early telophase, to ensure the chromosomes have been completely segregated. The movements of cytokinesis seen in the cell are caused by the same spindle network that was responsible for the separation of the chromosomes. Parts of the spindle responsible for moving chromosomes break down in late cell division, to be used in restructuring the two new cells. Cells can divide evenly, known as symmetrical cytokinesis, or one of the cells can retain a majority of the cytoplasm. During male meiosis in humans, for example, all 4 cells at the end of meiosis have the same size, and relative number of organelles. This process of spermatogenesis produces millions of small, but mostly equal sperm. Human oogenesis, on the other hand, divides through asymmetrical cytokinesis. This produces one very large cell, and 3 polar bodies. The smaller polar bodies do not become eggs. In this way, fewer eggs are produced, but they are much larger cells. Some cells, in humans and other species, do not undergo cytokinesis after mitosis, and form large multi-nucleated cells. Whether the cell division is mitosis or meiosis, cytokinesis happens in much the same way. Cellular signals tell the cell where to divide, which creates the division plane. Around this plane, the cytokinetic furrow will form, eventually pinching off to separate the two cells. The final process of cytokinesis in animal cells is abscission. During abscission, the actin-myosin contractile ring that creates the cytokinetic furrow is contracted all the way, and the plasma membranes undergo fission to finally separate the two cells. Scientists are still not certain what causes the specification of the division plane in different cells. The process is a complex process that involves many microtubules and cell signals. Once this position has been determined, the actin-myosin contractile ring must be established. Actin and myosin are the same motor proteins that cause the contraction of muscle cells. Muscle cells are packed with actin filaments, which the protein myosin can pull together, if given ATP energy. This same system is employed in dividing animal cells. Actin filaments form a ring at the division plane. Myosin proteins then start to pull the actin filaments together, creating a smaller ring. Eventually, all the cytoplasm and organelles have been exclude from the ring. The only things left are the actin-myosin ring and the microtubules constricted by the ring. This is called the midbody structure and it also must be divided in order for the cells to separate. This happens during the process of abscission. The proteins are cut and the plasma membranes are fused shut. The extracellular materially holding the cells together is dissolved and the cells can become separated. In some multi-cellular animals, cells remain closely associated, and can even form and keep connections between their cytoplasms known as gap junctions. These small bridges can be formed as remnants of the endoplasmic reticulum that gets trapped in the midbody structure, or they can be formed later. Plants undergo a similar process of cytokinesis, with the difference being the rigidity of their cells. Plants are surrounded by a secondary layer, the cell wall. This extracellular structure is responsible for helping give plants their form, and must be established when a cell divides. To do this, plants use microtubule spindle structures knowns as phragmoplasts. 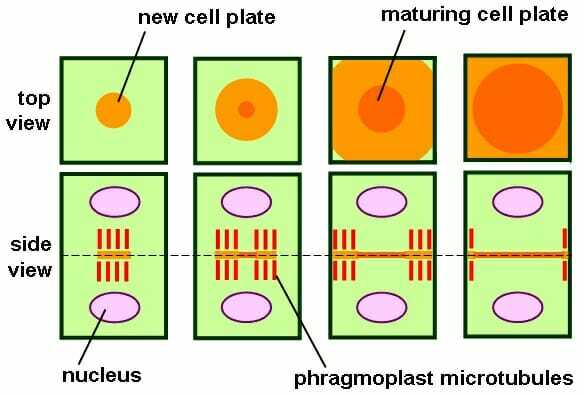 The phragmoplasts carry vesicles of cell wall material to the new cell plate. These materials, like cellulose, interact to form a complex and strong matrix. After the plate divides the cell, the plasma membrane will seal off, and the two cells will be separated. The phragmoplast, like the centrosomes of animal cells, organize the microtubules and direct their growth and reduction. The components for the new cell plate are created and packaged by the endoplasmic reticulum and Golgi apparatus. They are then sent to the phragmoplast, which builds the cell plate from the middle outward. This can be seen in the graphic above. The cell plate will start in the middle, and as it is completed, the phragmoplast microtubules move outward, until they reach the current plasm membrane. This membrane will be cut, and the cell wall will be fully connected between all the surrounding cells. Between the two cells, trapped endoplamic reticulum will create plasmodesmata, which are like gap junctions and allow molecules to pass from cell to cell. It is theorized that plants may use these plasmodesmata as a form of cellular communication. Cleavage Furrow – The fold in the cell membrane, created by protein filaments contracting. Karyokinesis – The separation of chromosomes, separate from the division of the cell. Plasmodesmata – Sections of plant cells that remain connected to other cells, sometimes formed during cytokinesis. Gap Junction – Parts of animal cell membranes that remain closely associated to surrounding cells, such neuron synapses. 1. A number of proteins are responsible for the timing of cytokinesis. To make and regulate these proteins, the cell must expend a considerable amount of energy. What are the benefits to having a well-timed cytokinesis? B is correct. A well-timed cytokinesis ensures that chromosomes are not destroyed as the cell membrane pinches apart. Ideally, the chromosomes should be well confined to the various poles of the cell. Often, cytokinesis will not occur until the nuclear envelope has reformed around the nuclei. The division does not occur faster, as the actin and myosin can still only constrict so fast. The timing of cytokinesis does not affect subsequent rounds of cell division, which is signaled by the amount of nutrients collected and the size of the cell. 2. During meiosis, a diploid organism with 8 total chromosomes undergoes two consequetive rounds of cytokinesis. After cytokinesis II, how many chromosomes are in each cell? A is correct. Cytokinesis I separates homologous chromosomes into separate cells. These chromosomes still consist of sister chromatids. The chromatids, or copies of chromosomes, are then separated into new cells in cytokinesis II. When the chromatids are separated, they function as independent chromosomes. In this way, 8 chromosomes divided twice gives 4 functioning chromosomes in each cell. The math is strange, but it is just dependent on the definitions of chromatid and chromosome. 3. Why must terrestrial plans build a cell wall each time they want to divide? Why not do it after cytokinesis? A. Too hard once the cells have been established. B. The whole plant could be weakened, structurally. C. The cell wall creates plasma membrane. B is correct. When a plant is growing, many cells are dividing at once, even in the base of the plant. If these cells were to lose their shape every time they went through mitosis, the plant would fall over, breaking many cells in the process. To avoid this, plants build one cell wall at a time, and slowly add the size and structure of all their cell wall continually.